Hālāwai and New York Outrigger are pleased to present Gracious Ladies NYC on the Hawaiian Airlines Stage at the Liberty Festival in Hudson River Park’s Pier 26 as part of the 2013 Hawaiian Airlines Liberty Challenge on Saturday, June 22. 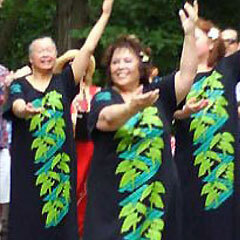 Gracious Ladies NYC (Nā Wahine ʻOluʻOlu). These lovely ladies met at hula classes that were taught by their beloved teachers, Michelle Nalei Akina and Janu Cassidy (Hawaiʻi Cultural Foundation). Hawaii called Nālei and Janu back home so, inspired by their teachers’ generosity of spirit and love of hula, the Gracious Ladies decided to continue to practice and perform hula as a way to share their aloha with each other and the community.